When he appeared at the High Court in 1969 as the lawyer for Nahashon Njenga Njoroge - the man who was accused of killing Tom Mboya - Samuel Waruhiu was at best a novice. Two years earlier, he had arrived in the country bubbling with energy having graduated with a law degree from the University College of Wales. But he was not prepared to handle a case that was to throw him to the centre of politics and law in Kenya. Waruhiu, who passed on yesterday in Nairobi, had been called to bar in 1967 at Middle Temple and was returning to Kenya to join a small army of African lawyers and political elites who were shaping the path of a new nation. But the Tom Mboya crisis and the Cold War politics had torn the Kenyatta government and divided the nation further as the succession struggle took a nasty path. In the political jumble, Mboya was assassinated and the young Waruhiu, who was not even a criminal lawyer was approached by Njenga’s wife, Grace, to take up the case “otherwise you (Waruhiu) would not live”. He was warned. That must have been threatening given that his father Chief Kungu Waruhiu had been assassinated on October 7, 1952 triggering Governor Everlyn Baring’s declaration of a State of Emergency in Kenya. Although he lost the Njenga case, Waruhiu’s image rose like meteor. At the African Club, along modern day Monrovia Street in Nairobi, he would hobnob with other elites and beneficiaries of Mboya’s airlifts to US universities. From here, he would socialize – and when free he would retreat to playing golf at the Sigona Golf Club, where he became the first African chairman of the club in 1974. But it was his entry into the boardrooms of blue-chip companies – and at a young age – that catapulted him into riches. He was by 1974 the chairman of Old Mutual and by 1990’s he was chairman of Barclays Bank. Waruhiu had earned respect among the powerful Kiambu politicians and especially Kenyatta who had lots of respect to his late father. It was at the elder Waruhiu’s funeral that Kenyatta attended one of his last public meetings before he was arrested. That Waruhiu would be headed for big tasks, albeit controversial, in the Kenyatta government emerged on the year he returned to Kenya in 1967. That year he was picked up to chair a board of inquiry that was to recommend on the composition of Teachers Service Commission and the place of Kenya National Union of Teachers. The inquiry was to avert another national teachers strike similar to the one staged in 1965. Waruhiu performed well together with Rev Andrew Hake. But though not all his views were accepted, he laid foundation for new thinking within KNUT that was picked up in 1967 by Jeremiah Nyaga when he took up the ministry of education. One of the first students at Kabaa-Mangu High School – as Mangu High was briefly known – in 1940s, Waruhiu would balance his legal activities with business building a law firm whose clientele read like a who-is-who in the business sector. While his brother, George, founded Waruhiu and Muite Advocates, Sam would practice under the umbrella of Waruhiu and K’Owade Advocates. With money flowing, and investment opportunities galore he would partner with the likes of Dr James Sidney Nesbit to purchase choice plots in Mombasa joining other elites in the mad rush to acquire wealth. Their company Neswa Investment Limited whose two shareholders were listed Samuel Njoroge Waruhiu and Nesbit took several acres of land at the beach. But Waruhiu will be remembered for his 400 page Report that he prepared in n1980 after he was appointed by retired President Moi to look at the terms of service for civil servants. Following the footsteps of Duncan Ndegwa, whose report recommended that civil servants be allowed to do business, the Waruhiu Report solidified that thinking. It was a thinking that was opposed by the likes of Habel Nyamu, a career civil servant, who always felt that this is the heart of corruption within government tendering system. Interestingly, Waruhiu was not interested in politics. But he will be remembered as the chair of the Trading Appeals Tribunal that enforced Africanisation policy in the commerce and industry. It was a body that laid the foundation for indigenous Kenyans entry into business. 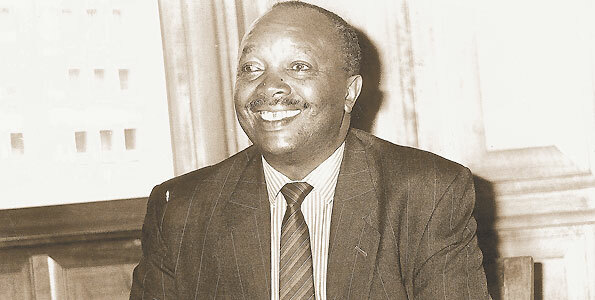 By the time of his death, Waruhiu was no longer listed as a practicing lawyer by the law society of Kenya and was not under any law firm having sold his interest in the Waruhiu and K’owade. He was an Eisenhower fellow Multi nation program 1965. during his fellowship he toured the US for 6 months meeting leaders and practising professionals in the legal sector. He chaired the fellowship here in Kenya until 2009. He was not only important to the nation but also to the entire extended family of senior chief waruhiu.R.I.P grandfather,uncle,great grandfather you have shown us the best way to live a quality life.